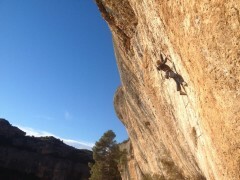 In March I headed back to Margalef, Spain to continue with my redpoint project of Innuendo up at Espadelles. This short (18m) route offers powerful and sustained climbing involving a hard crux on monos and bad crimps (Typical Margalef style). Unfortunately it wasn’t to be this trip. This is the closest I got, the lessoned learnt…book longer holidays!! Many thanks to the guys at Alberg El Raco De La Finestra in Margalef for another great trip. This must be my 6th trip back to Margalef, every trip I’ve found new routes, visited new sectors and met new people. I don’t think I will ever be tired of this destination. Only 2 hours drive from Barcelona and with cheap Easyjet flights it is the perfect winter get away for a budget weekend. Rock & Run have a nice write up on Margalef to give you a few more details. If you’re thinking of going, why not book in a training session prior to the trip to get yourself prepared. Enjoy the video! Innuendo, Margalef from Jon Redshaw on Vimeo.